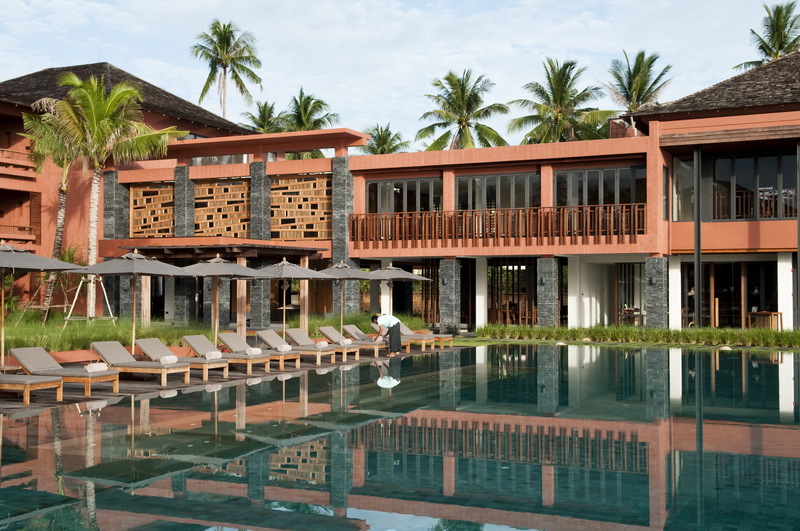 Meaning happiness/joy in Sanskrit, Hansar is an award-winning resort that opened in July 2010. The beach-front property has 74 rooms, all with a sea view; the website has a series of virtual tours for a closeup look of rooms and facilities. 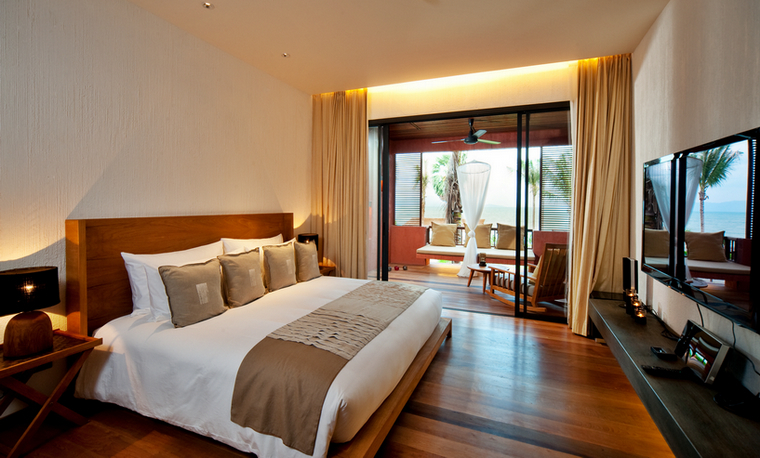 It is located in Bophut Bay, which is only around 10-minutes from Koh Samui’s international airport. Arriving at night there was little to be impressed by, however on arising the following morning and stepping out on to my balcony my first impression was I had woke up in paradise, the view was spectacular. I had seen the pictures on the website and was struck by the fact that in reality the resort was even better. From my balcony I overlooked the entire property, a kaleidoscope of green grounds and swaying palms dotted with colourful flowers, blue waters from both the infinity pool and the sea, complemented by red ochre hues and timber. I stayed in a Sea View room (50sqm). The attractive room features a large king-size bed (very comfortable) with the white of the bed linen juxtaposed against the timber that is a main feature of the room. The bathroom with its glass walls makes the entire space feel large and light, and features a sizeable stone rain shower. The water pressure is excellent and not many showers afford such a magnificent sea view. The use of natural materials (teak, stone, silk, linen), textured walls, and earth-tone colours is a theme that is carried throughout the room and the property, giving a sense of being in harmony with nature and a seamless flow from indoors to out. Splashes of colour are present, for example reds from a tropical floral arrangement and fruit platter. The enclosed balcony (on three sides) features a day bed, perfect for relaxing while taking in the panoramic tropical vista, a small table and a rocking chair, with cleverly recessed lighting that creates a warm ambience in the evenings. In-room amenities of note include tea and coffee making facilities, with a French Press (plunger) coffee pot and decent coffee, none of the instant rubbish, which is a bugbear with me. There is also complimentary wifi. Plus expected standards such as flat screen TV, hairdryer, safe, etc. Bathroom products are housed in large stone dispensers, a nod to the environmental priorities of the property, no mini plastic bottles here, and any packaging is from recycled materials. Additionally the traditional plastic laundry bag is a wicker basket, and a wicker bag is also provided, which is perfect for taking any items necessary for the pool or carrying any souvenirs without the need for plastic bags that are usually just thrown away by tourists. And the tidy room/don’t disturb sign is made from wood. Turndown service includes a red rose (that actually smells like a rose, so many don’t) and chocolates, a nice touch. Other room options include the Sea View XL and Beachfront. Breakfast was served in the hotel’s award-winning, all-day dining restaurant, H-Bistro, which is located next to the beach, affording idyllic views from both indoor and outdoor seating. I was impressed by the variety and quality of food on offer, served in smallish containers/plates/warmers that ensure that the produce always looks inviting. Buffet selections included fruit juices, fresh fruit, cold cuts, cheese, smoked salmon and condiments, pastries/breads/muffins, yoghurt, cereals, dried and stewed fruits, raw honey, hot items such as hash browns, baked beans, mushrooms, fried rice and Thai breakfast dishes. Guests can also select eggs (scrambled, poached, fried, three omelette options, Benedict) and pancakes and waffles made to order. While many options were available each day new items were added giving a sense of a fresh experience each morning. Other than the hash browns being cold everything else was excellent. I also had dinner at H-Bistro. I had been reading some good things about the chef and his Chef’s Table tasting menu in local publications so was keen to give it a try. Unfortunately there was some miscommunication (that I am still unclear about), but I think due to a rather large group enjoying the tasting menu that evening I was unable to partake of that menu. At the chef’s suggestion I had the slow-cooked beef (on the menu it is listed as Brandt Beef, which is excellent) but on this occasion the chef used Kagoshima wagyu, served with a celeriac puree, young carrots, mushrooms, puffed quinoa and bone marrow, with an intense red wine jus. A rich, satisfying dish that was executed with skill. Of the two desserts sampled, the standout was the suitably tropical, Pineapple ravioli filled with coconut sherbet served in an exotic fruit soup. Dinner, with food from H-Bistro, can also be enjoyed on the beach, but only two tables are available so advance booking is a must. In addition to the French Mediterranean focus, a good collection of classic Thai dishes, using premium ingredients and modern presentation, are also available. The wine list has some good choices by both the glass and bottle. 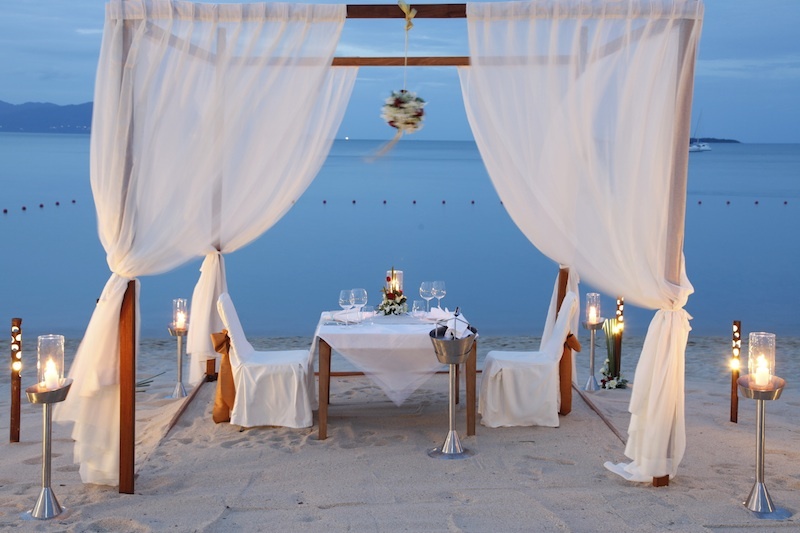 Other food and beverage options include, cocktails and canapes in the Chill Lounge (an open air lounge with sea views and oversized day beds), a light meal, homemade ice cream or refreshing tipple at the Beach Bar and Pool Deck, as well as 24-hour in-room dining. Sunset oyster and champagne/cocktails cruises aboard a luxury yacht is another option. For those looking for a hands-on food experience Hansar also conducts Thai cooking classes, that includes a visit to the local market. Yes, see top pick below. Hansar’s LUXSA Spa, a highlight of the stay, was a fantastic experience that commenced the moment I walked in to book my appointment. Warmly greeted by staff I was asked to complete a form that would then determine my body element (according to Thai herbalism) and the oil variety that would be used in the signature, 90-minute “The LUXSA” treatment that I had selected; there were many tempting options available. The friendly and knowledgeable staff made recommendations while I sipped on a warm herbal tea and learnt more about the teas served in the spa and their health properties, some of which are made from flowers that are grown in the hotel’s organic garden by the staff (see Anything else? below). On the day of the treatment I arrived the requested 15 minutes early, I was given a cold herbal tea and a refreshing cold face towel before being led to the treatment room, where I enjoyed a steam with the scent of eucalyptus. The treatment itself began with a floral footbath and gently foot and lower leg scrub with a mix of sugar and essential oil. The massage itself lasted a full 90 minutes (not the case in all spas with some 90 minute treatments translating to only an hour of massage). The LUXSA aims to balance the elements, relieve mental and physical fatigue, reduce stress, and balance the nervous system translating to a sense of well-being. I certainly felt like a new me after the treatment and would go as far as to say it is one of the best massages I have ever experienced. The therapist was obviously into what she was doing, you could feel it, with a combination of Thai and other massage styles, and some highly enjoyable techniques that I had not experienced previously. My entire body was massaged into a sense of uber relaxation, and for the final part of the treatment I needed assistance sitting up, I felt merged with the treatment bed I was that relaxed. I was also asked if the pressure was enough, and if the lighting, temperature and music were at a suitable level. One thoughtful touch was the essential oil used is kept warm so it feels very comforting when applied to the body. The treatment ended as it began, with herbal tea (this time hot lemongrass) and a cool towel. Regardless of whether or not you are a guest of Hansar the spa is worth a visit. I read in a guide to Samui’s spas (after my stay) that, “There’s a certain magic in the air here and you’ll easily fall under LUXSA Spa’s spell of enchantment”, which I whole-heartedly agree with. The spa is spread over three floors, has a large reception, six treatment suites, including four spacious double treatment rooms, each with steam room. There is also a dedicated area for manicures and pedicures and some treatments can be given on one of the outdoor salas. Couples can opt for the Pamper your Partner treatment that involves massage lessons. The spa also offers light, healthy and organic bites. Others amenities include an infinity saltwater pool (15x30m) with in-pool Jacuzzi, a kid’s pool, fitness centre, library lounge with complimentary computer use and a variety of books for borrowing, and a gift shop selling stylish wares. A sizeable beach that provides a good morning or late afternoon walk. The sand is quite course though compared to some other beaches in Samui. Having grown up surrounded by the pristine waters of Australia’s east coast I have extremely high standards when it comes to swimmable seas and found the water at Bophut was not as crystal clear as I had imagined it would be (something I thought of all three beaches I visited). However it should be noted that many guests seemed to be enjoying their swim in the sea. Sun-beds and umbrellas are set up on the beach in addition to around the pool. There is a stream of hawkers selling everything from ice creams to sarongs wandering up and down the beach but compared to Bali they don’t try any hard sell techniques and a simple ‘no thanks’ sees them continue on. Anything to do within walking distance? The hotel is located minutes away from Fisherman’s Village, featuring old wooden shop houses that are becoming fewer and fewer that are now home to trendy cafes and bars, beachfront restaurants, pubs, and shops selling souvenirs, plus the odd street food vendor. On a Friday evening the street is closed to traffic and becomes known as Walking Street, attracting locals and tourists due to the vibrant market atmosphere and a chance to take in a wide selection of local arts, crafts and a range of local street foods, many of which are difficult to find on restaurant menus. No, I would have to really nit pick to complain about anything. Hansar has a growing and developing organic garden and fish farm. It is noteworthy, as it is a corporate social responsibility initiative that sees the majority of produce being given to orphanages, the poor and local monks. Any that is sold the proceeds are given to local charities, and when there is a real excess of any particular item it is given to staff who usually cook up a dish with it at home, which is then shared with colleagues at the staff canteen. An attractive property (inside and out), ideally located, friendly staff, good food, fantastic spa — just some of the reasons why I would have no hesitation staying at Hansar again. Images & Music: Images (both in the article and the slideshow) are courtesy of Hansar Samui and the author, all rights reserved. Music (used on slideshow) is copyrighted to Peter John Ross, sonnyboo.com. I visit this site regularly, and enjoyed this post and the fastidious details, thanks. Such a lot significant info for me in this article. Also I wanna remark that the website taste is wonderful, the articles are really great : D.
for yoir time due too this fantastic read!! have youu saved as a favorite to look at new things in your web site. I’ve joined your feed and look ahead to more of your fantastic posts. blogger but I’m still new to everything. Do you have any tips and hints for rookie blog writers? Hey! This is my first comment here so I just wanted to give a quick shout out and say I genuinely enjoy reading your blog posts. I don’t drop a leave a response, however after reading through a bunch of comments here I do have a few questions for you if you don’t mind. Could it be just me or do a few of the responses appear as if they are coming from brain dead people? 😛 And, if you are writing on additional sites, I would like to follow you. Could you make a list of every one of all your public sites like your linkedin profile, Facebook page or twitter feed?